As a responsible parent, it is your responsibility to ensure that your child is safe even when he or she is sleeping. With this in mind, the best toddler nap mat will serve as an alternative bed for the child whenever he or she is not at home. According to some research, nap time is important for the development of any child. For instance, naps are known to improve behavior and cognitive development in children. However, you must ensure that your toddler is safe and comfortable whenever he or she is napping. Consider a nap mat without flame retardant chemicals, which will be healthier for your baby (Source). These days, choosing the right mat from the hundreds of nap mats available can be challenging. Hence, to make the choice easier, here are reviews of five top-rated toddler nap mats. Remarkable quality, portability, and enhanced durability are some of the aspects that set the Wildkin Nap Mat Olive exceptional. 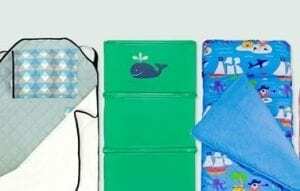 The product is made of soft microfiber material, making it a comfortable and durable nap mat for toddlers aged from three to seven. The quality microfiber material used to make this product is also breathable and offers maximum cushioning. Initially designed for enhanced portability, the mat features a travel-friendly design. In this regard, the product is lightweight and compact enough. Additionally, it is easy to roll up, fitted with Velcro fastening straps, and boasts a carrying strap. Moreover, this Wildkin product features an all-in-one design: It consists of a pillow, a blanket, and a sleeping pad. Likewise, the pillow is removable and all the components of the product are machine washable. This makes it easier to clean and dry. Lastly, this nap mat is free of phthalate, BPA, and PVC, which makes it eco-friendly and safe for your child. It is also backed by a replacement warranty by the manufacturer. Is your toddler a Trolls fan? 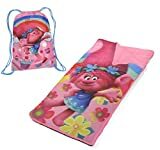 If so, he or she will definitely love this Dreamworks Trolls Drawstring Carry Bag with Nap Mat. The product offers a captivating visual appeal with stunning patterns alongside great sizing and comfort level. As mentioned, the nap mat comes with a convenient drawstring carry bag. 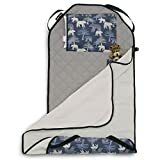 This makes it easier for your child to carry the nap mat with him or her wherever he goes. Additionally, the mat itself measures 30 inches wide, 26 inches long, and 3 inches high. Thus, its size is perfect for almost any toddler. Finally, this product also has a side zipper, which makes it easy for the child to get it in and out. 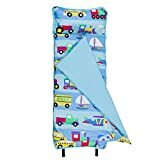 The Urban Infant Tot Cot Nap Mat offers your child an all-in-one bedding solution for his or her preschool and daycare days. The product is specifically designed for toddlers aged from two to five; thus, it has all the features children within this age group will require. As an all-in-one bedding solution, the Tot Cot features a small removable pillow, a blanket, and a quilted lining. Moreover, the product is easy to roll up and is fitted with a carrying handle. Such features make it easy for the child to carry. Lastly, with the Tot Cot, washing and drying will not be cumbersome and time-consuming since the mat is machine washable. In this regard, you can cold-water wash and tumble dry the product. This may not be the lightest product on this guide, but is affordable, lightweight, comfortable, and easy to wash.
As one of the best products in the industry, this nap mat is recommended by several daycare centers and kindergartens in the country. Additionally, the product has earned itself a Greenguard Gold certification, which means that the mat is both safe and comfortable for your child. Moreover, it is entirely sealed, waterproof, and radio-frequency-sealed. This is done to make the product more resistant to germs and bacteria. For enhanced comfort, the product features two-inch thick cushioning, too. This makes this product one of the most comfortable nap mats available in the market today. Lastly, you will also find it easy to fold and store, making it very practical for daily use in and out of home. 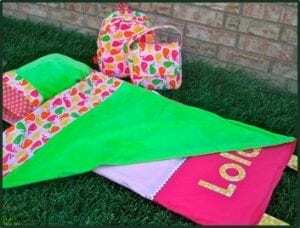 Last but not the least, here is another affordable, large, and lightweight nap mat that is suitable for children between the ages of 2 and 5 years. The product includes a mat, pillow, and blanket. Meanwhile, the mat itself is easy to roll-up and is equipped with a Velcro closure. It is also fitted with a convenient carry handle for enhanced portability. On the other hand, the product’s blanket is made of 100% polyester fill. As such, it should be cold machine washed separately in gentle cycles. As you may be aware, nap time is important in the development of toddlers. Napping allows the toddler time to recuperate energy they need throughout the day. To do this more effectively, the toddler will need a good nap mat. Although there are numerous nap mats to choose from in the market today, not all of them are the right choice for your toddler. So, what makes a nap mat suited for your toddler? Choosing the right mat for your kid does not have to be hard or complicated. Understanding what to look for in these products will definitely make the choice a bit easier. The materials used to make a nap mat determine several of its properties. To begin with, your preferred product must meet the current US safety standards. Particularly, you need to check whether the materials meet international standards for chemical emissions and flammability. Then, the material needs to be soft and comfortable for the kid to lie on. Some of the materials you may opt for, in this case, include polyester and cotton. The material used to make the mat should be relatively easy to clean or wash. It is also advisable to go for the more durable mat materials that tend to dry faster after washing. Different nap mats differ in terms of weight and design. For a kinder or preschool nap mat, it is advisable to buy a product that is lightweight and portable. The right nap mat for your toddler should be easy to carry from one place to another. Additionally, one such feature you should consider is the closure system. For instance, a Velcro closure will make the mat easier to secure in place after folding or rolling. Lastly, ensure that the product has straps or comes with a carrying bag. Such features make toddler nap mats more portable. Your preferred mat should not be too large or too small for your toddler. As you may have noticed, different nap mats may be classified according to different age groups. In order to choose the right product, you have to consider your child’s age and physical size. Basically, it is advisable to choose a mat that is slightly larger than the child; we all know that most children grow fast. This way, you will not have to buy a new mat for the child every now and then. Nap mats for toddlers need to be cleaned regularly, at least once every week. This is why you should go for a material that is relatively easy to clean. You also need to consider the amount of time the product takes to dry after washing. Plus, if the child spills something on the mat, you will need to wash it off. With a faster drying material, the mat will dry in time for the child to use it the next day. Take note that your preferred toddler nap mat should be durable even with repeated washing. For enhanced portability, some of the best nap mats for toddlers come with removable pillows. A removable pillow also makes the product easier to clean. Additionally, by removing the pillow before you wash the mat, you will be reducing the likelihood of the pillow getting damaged by repeated washing. Thus, it is advisable to choose a nap mat that features a removable pillow. Not only should a nap mat be safe, durable, and of the right size; it should also be comfortable for your toddler. For enhanced comfort, the leading toddler nap mat brands are offering additional padding in their products. If your preferred mat has additional padding, you should ensure that the padding is of the right thickness. Lastly, the thicker the padding in a mat is, the more comfortable it will be. However, padding that is too thick will make the mat heavier and more difficult to wash and clean. While nap-time is essential in the growth and development of toddlers, so choosing the right mat can be a challenge. The various toddler nap mats available today are of different sizes and have different features. As such, not all of them will be suited for your child. Basically, the right nap mat for your child should be of the right size and material. Additionally, it is advisable to choose a product that is easy to wash, portable, and comfortable for the child. 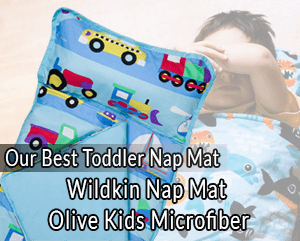 Hopefully, this guide helped you choose the best toddler nap mat available today.